Wireless CO detection and ventilation control system. Developed for large enclosed parking structures. 24 Hour Carbon Monoxide Wireless Sensor/Transmitter using industry leading XBee-Pro® DigiMesh wireless mesh architecture. 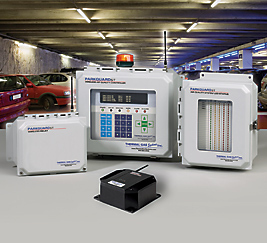 PARKGUARD S/T-Wireless parking garage CO sensor/transmitter system features an integrated mesh network of wireless transmitters and central controller. The PARKGUARD central controller interfaces with standard independent programmable logic controllers (PLCs), distributed control systems (DCSs), energy, and building management systems (BMS). The PARKGUARD Sensor/Transmitter continuously monitors CO concentrations. If CO values exceed set limits, dampers, supply and exhaust fans are engaged via wireless remote relay modules. PARKGUARD CO monitoring satisfies local code requirements and reduces energy costs required for ventilation of enclosed areas used for vehicle parking, repair and operation. APPLICATIONS: Single or multi-level, enclosed, vehicular structures including; parking garages, truck loading docks, vehicle maintenance facilities, airplane hangers, tunnels and warehouses where an accumulation of hazardous gases may occur. Multi-zone, multi-sensor system utilizing electro-chemical gas detection. Long-lived , plug-in, battery/sensor cartridge eliminates need for separate sensor battery replacement schedules. Immediate savings with wireless installation. Reduce energy costs, reduce ventilation maintenance costs. Why run ventilation systems when you don’t have to? PARKGUARD® is guaranteed for one year from the date of shipment. Any device found defective in that period will be repaired or replaced free of charge. Read terms and conditions of sale for complete warranty information.